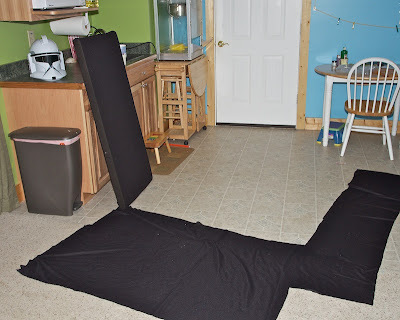 I've been thinking to make a separate thread on the DIY construction methods of hang-able acoustic panels, that can be located specifically only where needed. Also moveable as your speaker type/location changes, your treatment needs may change. Currently none exist that give a really good start-finish, I've searched AVS forum. Just these for Fabric frames, which are integrated as part of the wall itself, not hanging and specific locatable. 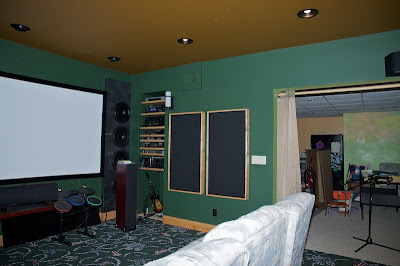 In my viewpoint, the Acoustical Treatments Master Thread is more for the theory, science, and practical application for acoustics of your particular room situation/issue, not the DIY construction methods, that will clutter it too much. 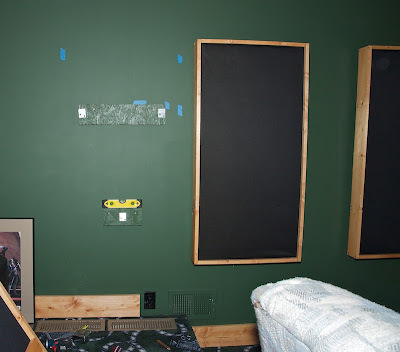 This thread purpose is NOT what your rooms acoustic needs are, rather once you study, plan, and develop your rooms acoustic needs, how to go about building it yourself. since making this thread some specific acoustic issues have been discussed and addressed, however there are other more suitable threads for the theory, think of this as the application thread. There are already "fixed" bass trap threads, here are links to them. Gearslutz.com, here is a link to their "How I built my bass (broadband) traps..." sticky, over 31 pages of info! I added my own twist to building corner superchunk with "green" material, some might like a different approach. 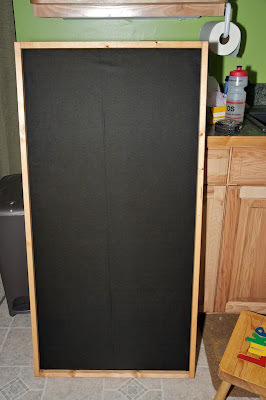 I'd like others who make DIY hang-able acoustic panels, whether absorption, diffusion, reflection, etc. to also feel free to add your construction techniques/methods there. >>We need to learn from you! A) read this Acoustics/Treatment Reference Guide , via gearslutz, its a easy read in layman terms, starts you off with basics and good foundation with practical discussion. 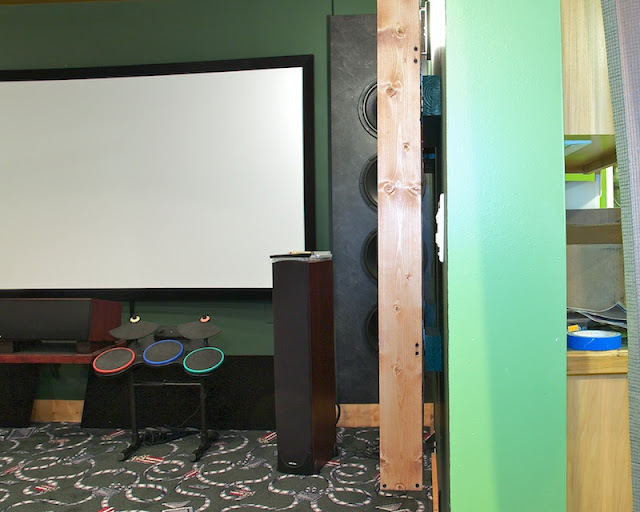 Studio acoustics and Home Theater acoustics. 2. Define your MLP (Master listening position). Confirm with measurements. 3. Identify and treat your modal and SBIR - Speaker Boundary Interference Response related issues and educate yourself about different bass-absorbing techniques. Always base your decisions regarding different treatment, on measurements. Avoid thin porous only absorbers (including wall to wall –carpet, drapes etc.) unless a measurement indicates the need for it. 1. Speaker location, 2. Listener position, 3. 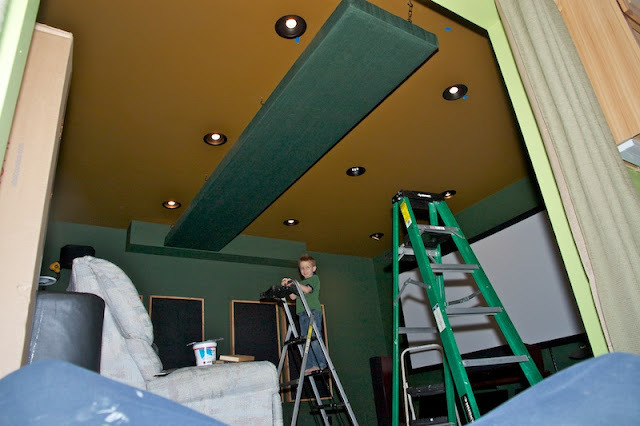 Acoustic treatments, 4. Electronic correction. Understand the small room acoustic model you will follow. Looking at this link, everyone can see visually the various small room models, it's 7 pages from the book "Acoustics and Psychoacoustics Applied"
-read one of many books out there, a great 1st book is "Master Handbook of Acoustics" by F. Alton Everest, a perfect follow-up book is "Sound Reproduction: The Acoustics and Psychoacoustics of Loudspeakers and Rooms" by Floyd Toole. -shameless plug for Ethan Winers book also, "The Audio Expert". ........RPG Acoustics Library papers http://www.rpginc.com/news/library.htm, etc. -a while back I downloaded this Measurement/calibration sequence from Dennis Erskine. ComradeBrehznev, Noman74656, Boomassiv and 1 others like this. Last edited by mtbdudex; 04-02-2015 at 10:23 AM. 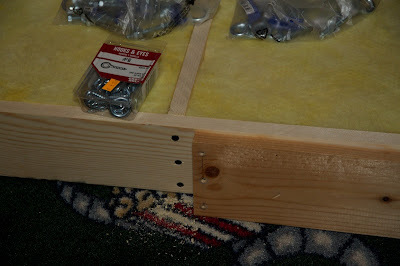 -Keep frame fastening simple as possible, ie screws instead of dovetails/etc. Many ways to build a box. 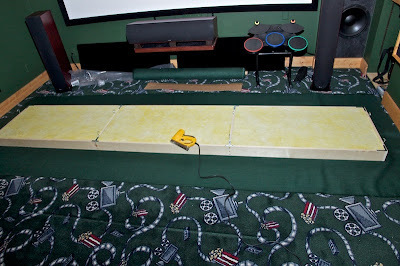 1st prototype Mock-up 2' x 4' panel w/o cloth cover. This was quick and dirty, I used scrap 1 x 4, and routered a 2" wide 1/4" deep channel down the center to hold the fiberglass. 1" x 4" pine frame will be stained, just OC703 itself will be wrapped. 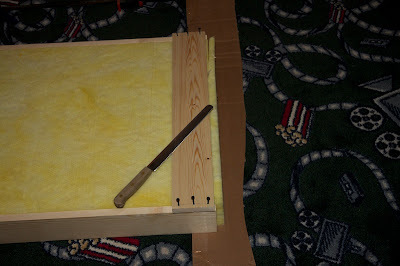 There will be a 1/2" or 3/4" gap @ back of fiberglass to frame edge on front side, and 1" or 3/4"gap @ backside. Yes, for the frame enclosed panels I plan not to use spray adhesive, just pinned. At some point in future I'd like to spend a few $'s and have a printed pattern for the panels, this makes that upgrade option easier. Last edited by mtbdudex; 02-28-2016 at 01:14 AM. 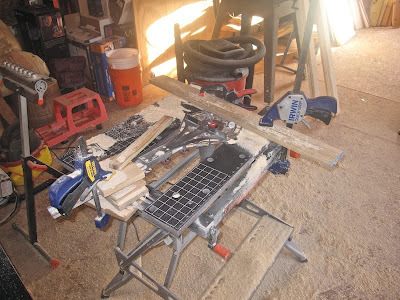 Router set-up, since I did not have a table saw router extension (about $300), I made my own as shown. >>Caution, exposed moving parts here, use with care. I used a MILESCRAFT TurnLock 3-in-1 Router Guide Kit Model #1223, flipped upside down and clamped a board parallel to it for straight feed. I used a 1" bit bought from HD for about $25. Set the router @ 3/4" in from edge, a "fat" 5/16 deep, make 2 passes. Each 1" x 4" 6' pine board is cut 23 1/4" for top/bottom, the remaining piece becomes a side piece. 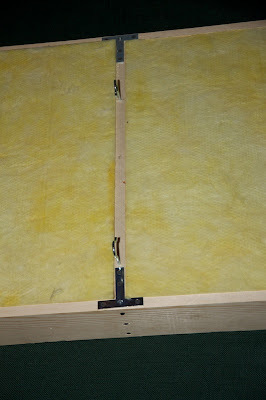 Edge boards are complete routered with 2" channel as shown. Side pieces are routered as shown with the 1" bit (again make 2 passes) within 5/16 of the edge. 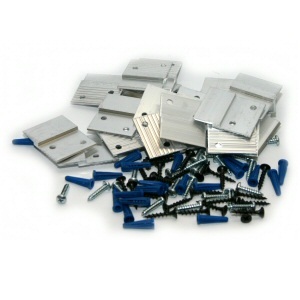 >>Having these true and square will ensure when using them to guide the 1 5/8 drywall screws into the top piece you won't have any problems. (a counterboar bit is perferable method as "erkq" pointed out. In a pinch I take the drill that is slightly bigger than the screw head, do a manual mini-counterboar slowly, then put the drill in reverse and give full power with pressure. 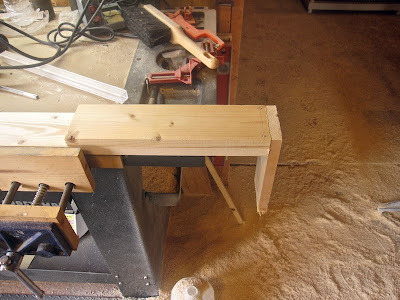 Corner clamps to hold square while screwing in. I forgot to take a picture of the (2) "Z"channel braces, since they are 3/4" thick they fit flush inside the frame. I located them 12" and 36" down from top, each had (2) drywall screws each side to keep from twisting when hanging onto the "Z" channel. Wrapping fiberglass 101, it's itchy be careful! 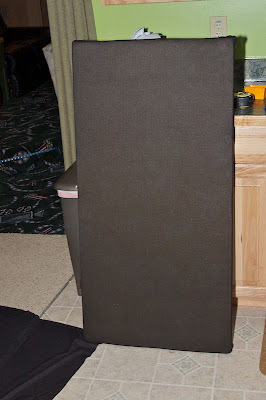 Cut to size, my speaker grille fabric came from Joanns, 60" wide, I bought 15 yards, $8/yard with coupon normal $9.99/yard. 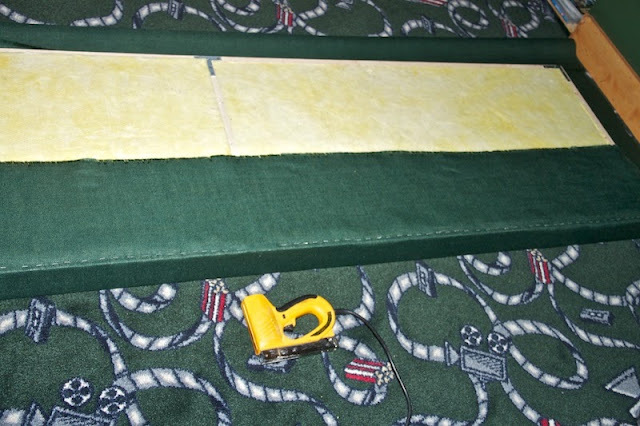 wrap a side and pin with 1 3/4" pins, angles to stay in from tension. Complete the wrap, it's my first time, got decent at wrapping and pinning. Went real quick w/o mess. They were set 3" in from each frame edge to have invisible look and the frame sorta just float there. 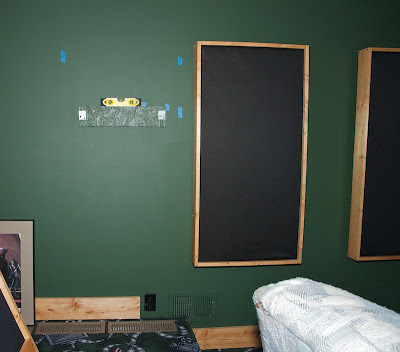 Wall to frame spacer/holders were pre-made, pre-drilled (each then acts as its own drill jig for holes into the wall), and painted wall color prior. Mine were 19" wide and 3 1/2 tall, and 1 1/2 inches thick, basically scrap stuff I had lying around. Measure twice, use blue tape for visual markers, locate top holder, mine was a 1 1/2" thick piece so the panel would have 2" air gap. Hold with hand, drill into drywall with 3" deck screw, mini-level assures level, Locate bottom holder, drill into drywall with 3" deck screw. Remove, use drilled holes to locate the 50lb plastic dywall anchors------Re-attach top/bottom holders, using 3" deck screw. -the cloth wrapped fiberglass is nicely held rigid in, no worries about it ever coming out, even due to my kids possible "abuse". That's why I made channels instead of just "boxing it in"....I was un-sure about the robustness of just that way. -a 3 point mtg, 2 top and 1 bottom, is very secure and quite easy to locate and level, don't be concerned so much. -the WAF is extremely high on these, she likes them! Nice job, detailed presentation. Thanks! But this struck me... just a little thing, though... why not just use a counter-sink? I agree - and edited the post above, the right tool for the job approach, honestly I don't have any countersink bits, just never bought them. In a pinch I take the drill that is slightly bigger than the screw head, do a manual mini-counterboar slowly, then put the drill in reverse and give full power with pressure. 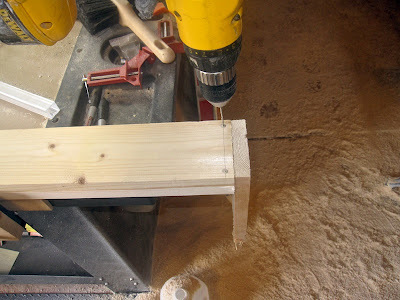 The angled face of the drill going backward will remove all burrs/etc and make a fine seating area for the screw. My 75 year old dad has countersink bits and I've used them countless times growing up in the 70's, since he does not do DIY anymore I'll get them as "hand-down-to son" next time I visit. 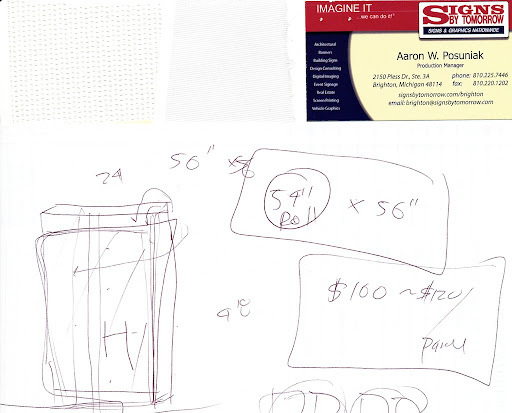 Leave it to a professional engineer to make a prototype first. Anyway, good job on the pictorials, more pictures of DIY is always a good thing. I would worry about vibration issues with a conventional picture hanger. 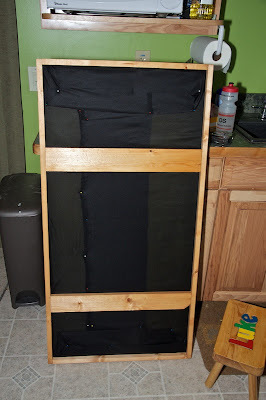 It is designed to hold the top of the frame 1/4" away from the wall, so it would have most of the frame hanging free. I'd consider a french cleat top and bottom. Another thought is what I do for poster frames. I string a triangle of picture wire inside the frame. 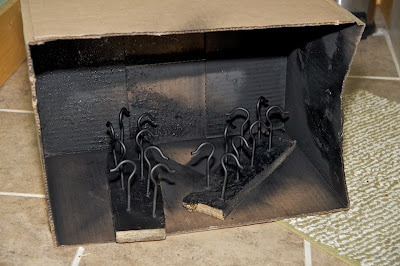 The constuction of the frames means the wire is held about 3/8" in from the back surface. When I hang the frame, the weight will pull the wire taught and this in turn pulls the frame tight against the wall. ....I'd consider a french cleat top and bottom. Another thought is what I do for poster frames. I string a triangle of picture wire inside the frame. The constuction of the frames means the wire is held about 3/8" in from the back surface. When I hang the frame, the weight will pull the wire taught and this in turn pulls the frame tight against the wall. How'd they work for you? Any rattles like jayn_j mentioned? Prior to deciding I was going to have the 2" air gap, I was going to do something similiar, use these on wall with screws on the frame back - screw would be wedged in the "v" slot was my thinking, then felt at (4) corners to induce some tension into the system for rattle free. Not sure how that would have turned out, since I did not "prototype it"
Now, I can see accuracy for leveling would be much harder with these than "z" clips. I was 90% going to do the DIY French Cleat method - my DIY screen uses them, but was worried about rattles and more so the need for more accuracy for level adjustment. The "z" clips are really quite forgiving for alignment, about 1" of bearing surface up/down and side/side, that makes leveling not an issue. Plus, they securly grab each other in a force/spring tension clamp, pretty slick guys at very reasonable cost. 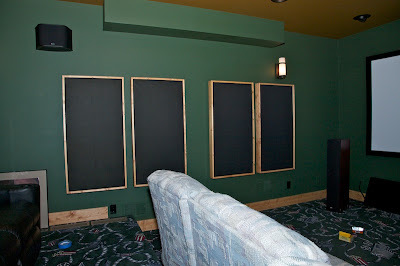 As I completely wrapped the frames with the fabric, the fabric buffers between the walls and keeps things from rattling. If a person were to do bare frames like yours, they may want to put one of these at each corner. As for the suggestion of double French cleats by someone Talk about overkill. I'm not filling these things with shot, just insulation. 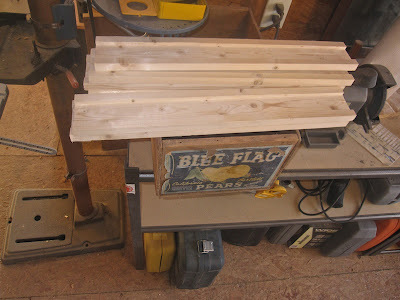 i am making the same type of panels that you have......2" 703, 1"x3" pine (2.5" actual depth). 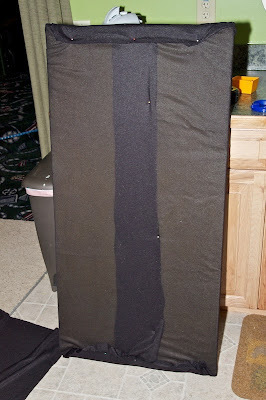 covered the whole thing with fabric. When I said double french cleats, I meant one on the top and one on the bottom. The bottom one is not for weight. It traps the bottom and keeps it tight against the wall. Smokarz, I don't have access to a drawing program here. I'll try to take a picture tonight. 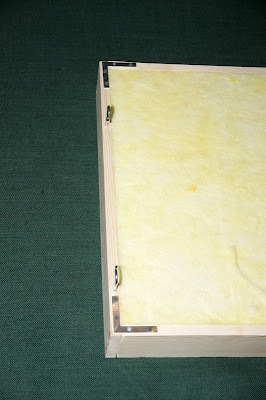 Basically, I created the frame and placed three eyelets recessed 3/8 - 1/2 inch in from the back edge. Two eyelets are 1/3 of the way down on each side. One is in the center of the bottom. Then string picture wire to complete the triangle. Pull until it is semi-taught, but allow 1/2 inch or so of play when pulling on the top. I mounted two heavy picture hanging hooks on the wall. To mount, center the frame over one of the hooks, reach behind and snap it in place. Pull the frame horizontally so the hooked side is toward its closest edge. Reach behind and snap the other edge in place. Center the frame on the hooks so it hangs level. The tension of the wire will pull the frame back tight into the wall. I use something similar to Suntan's dots, except they are flat and about 1/8 thick. Use 6 of them for a 27x41 frame. Even still, just one French cleat is total overkill for these things. They aren't that heavy. If you're worried about them rattling, or being bumped off the wall by passersby, there are better methods of securing them than just having them rest on French cleats. While driving in a small industrial park this past weekend in Brighton I saw this print shop, stopped in and asked them about printing acoustic panels. We talked for about 10 minutes, they can do what is needed and gave me (2) samples. The material is white then they print the image you have. Just ballpark cost was $100-120 for a 54" x 56" printed panel, the roll is 54" wide so actually they are flexible to the other dimension. There is a "fixed" cost for their time/set-up, then printing more than one may have some overall lower cost. I gave both samples the "breathe" test, and both were flowable, which is needed for mid-hi freq. What I'll do further before ordering some is get an already printed piece from them on both materials and take some measurements. The blocky looking one was slightly less flowable. Since I have speaker cloth, that will be my baseline. I scanned the info, hard to see the 2 types of cloth weave in the scan. Since another hobby of mine is Astrophotography, Top 10 in 2010 to shoot (Astronomy, non telescope) , I'll probably take some better pictures of the Milky way, Andromeda galaxy, etc, and use those for the prints. Just in case you were not aware, you can have panels made with your choice of print. Here is one, but there are a number of other places that will do it too. Kinda takes the DIY out of it, but the option is there. 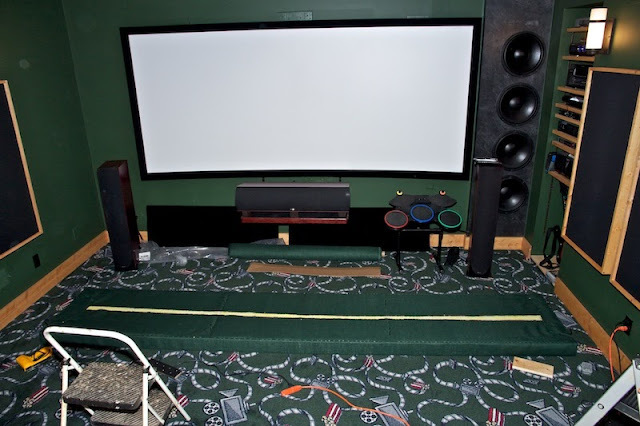 I'd also like to add some of you with completed Home Theaters may have your DIY hanging panels methods buried in your HT build thread, PM me that build/thread/post and I'll put a link in this thread top post to yours with "credit" to you. 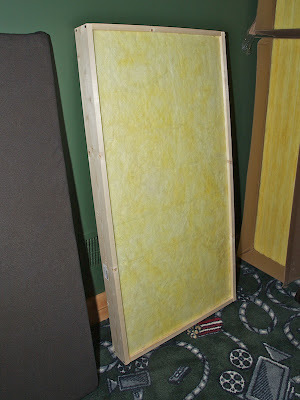 fwiw, I'll be making some non-framed panels for my front wall in near future. 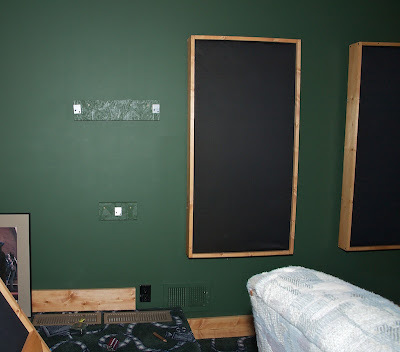 Those are sweet looking panels, and considering the time I've put into mine their prices are very reasonable for those not into DIY, as are some of the other sites (RealTraps, etc). What I like about doing it with this small company is they are local - helping Michigan economy, I can have face-face time, etc. 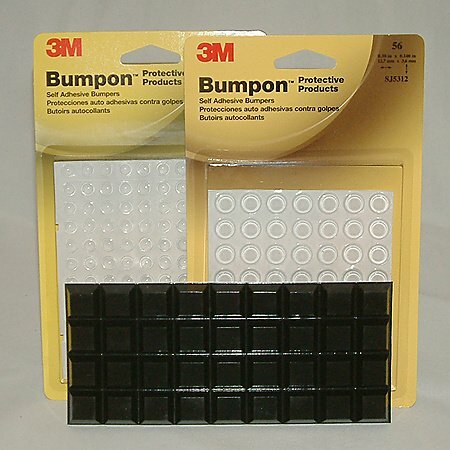 i went to home depot, picked up 12 of these for my frames. I'm interested to see your results. The printing process is called Dye-sublimation. Basically the print is dyed into the fabric instead of printed on the fabric. If you print on the fabric it would clog it which would take away from the absorption. BTW one of my favorite painters in Germany gifted me a HUGE digital file of one of my favorite paintings from him. Truly was a honor as I think I am the only one to get it. It is DD Ramone in the picture playing in the late 70s (I believe) in Munich. Florian Süssmayr, the painter took the picture when he was a teen then painted it about 6 years ago. I still need to take some pictures of it hanging in my condo. If you print on the fabric it would clog it which would take away from the absorption. Hey Mike, my telescope purchase will be early March - so for the next 1-2 months this is in planning/study phase. Taking many images, stacking them, then the Post Processing (Apple Aperture 3, Adobe CS5, and DSS - Deep Space Stacker) is something I've gotten decent at, but for my "keepers" to print I'll probably be really picky. fwiw, this is the mount/tripod, I've not decided on the actual optic tube just yet. Thx for advice on the printing process, I'll review that with the place I found and it they arent capable then I'll have to do more looking. Like I said, after making my DIY panels I can really appreciate all the time and effort your company (and the other suppliers) go into making a quality product. Simply, I love wood products and yours are 1st class beautiful! Thx erkq for the link, I'll have to confirm the place I found what material and process they use, and if not suitable then yours is on my list to contact. 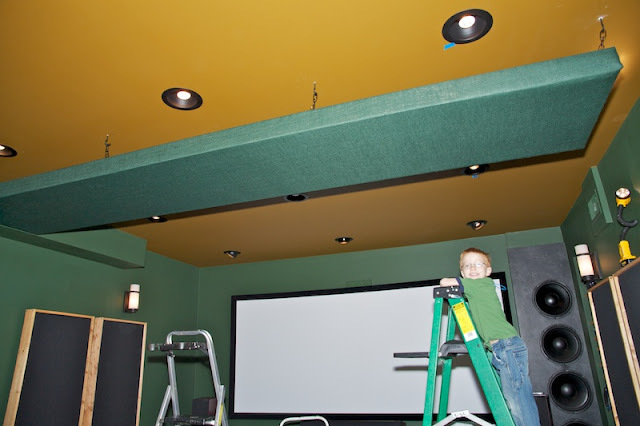 Today's project: Home Theater Ceiling Acoustic "Cloud", status: 1 Completed and installed! It actually handles the 2nd row 1st reflection points, I'm holding off making the 1st row 1st reflection points Acoustic "Cloud" until I'm done with Bass traps in the corners and do some detailed room readings. 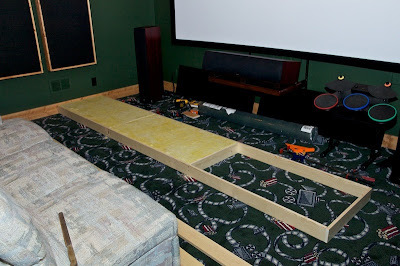 Note: I separated each 2' x 4' sheet "zone" with a 1" x 4" x 23 13/16 support, reason 3/16 shy of 24" is I wanted to "grab" the 2' x 4' sheet lengthwise by tightening the screws, it worked and held the fiberboard nicely. 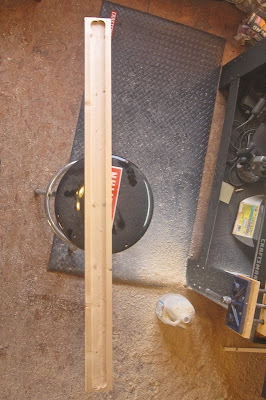 I used a 24" clamp to squeeze the 2 outside boards together as I did the final tighten. Has anyone tried to find 1" x 6" x 12' straight lumber lately? I actually had better luck buying 1" x 10" x 12', dead straight, and then ripping it exactly 4" thick to hold the (2) stacked OC703 sheets. Got (2) 4" wide 12' long pieces that way, dead straight. Important to look at the endgrain of boards you buy also, you want boards from the outer rings of the tree, they are more stable. Having used the simulation software for the 1st reflection points, transferred those locations via blue tape onto the ceiling. Then, with the build wood box, get exact mtg locations via blue tape and much measurement/cross checking. I'm hanging these into the ceiling joists also. btw, My favorite tool for long straight lines is still this "Strait-Line 64001 Laser Level", $39 @ Home Depot 6 years ago, it has little pins that hold it even upside down. Buy lots of hardware, then decide exact method OJT (on the job)....this is after all my 1st time doing this. 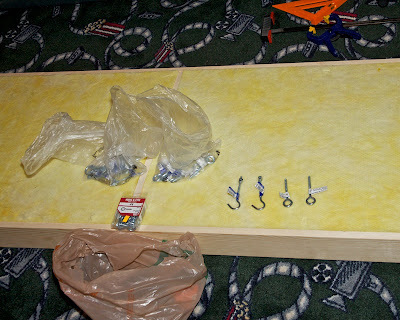 I ended up going with #6 J hooks for both the panel and ceiling, and black chain. Will return most of the stuff you see here. Made this handy drill jig so I can have straight/inline screws. The 5 minutes it takes to make these pays off with good results later. Add T and L supports to the box, and of course the fabric ordered and delivered (I got 20 yards of 56" wide forest green fabric). 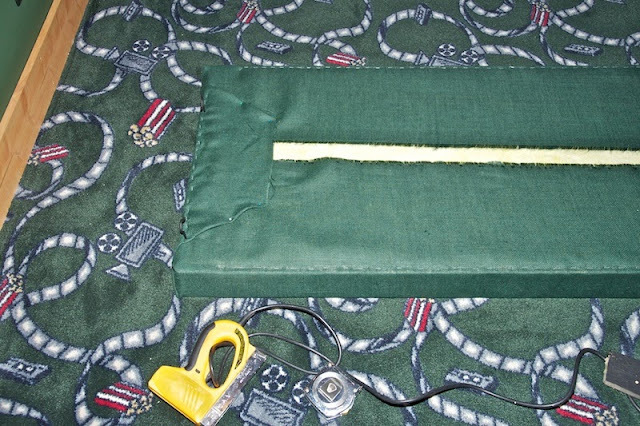 Cut fabric and get ready to use that electric stapler! Showing detail of T and L braces, I was worried about hanging and wanted some insurance for rock solid box. Note: I drilled and pre-installed all J-hooks, so after the fabric was wrapped I just had to find the hole and re-install them. 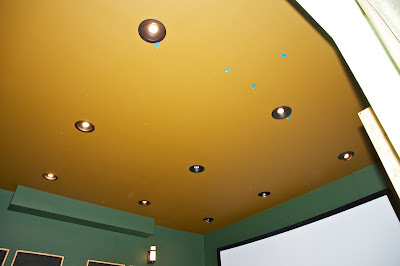 Plus, gave exact placement for ceiling transfer of matching locations. 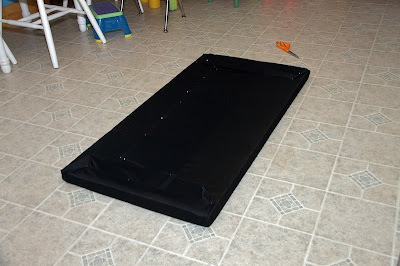 Flip up on edge, now its a 2 person job, my wife pulled down to keep the fabric taught while I stappled. I should state I was worried about wrinkles, I pulled slightly lengthwise on each end and put 2 temp staples to keep tension longwise for no wrinkles, it worked. Finish stapling, it's like wrapping a big Christmas gift, keeping the material taught so no wrinkles is the secret. Edges wrapped like a box gift, this is ceiling side so "perfection" not needed here, still want a secure wrap. Black hooks and chain waiting for the big box. 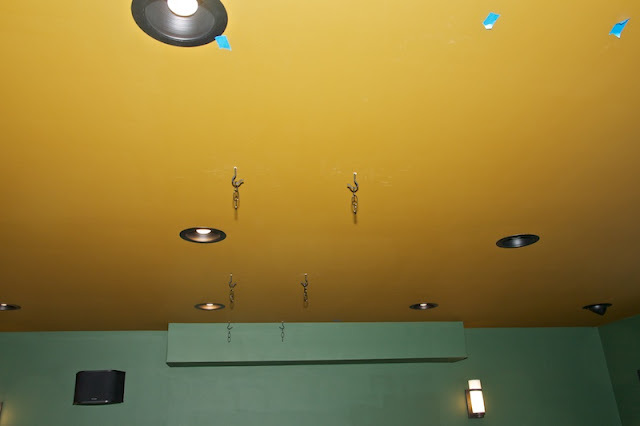 Hopefully all the measurements were transferred to ceiling correct, holes drilled correct, etc. Measure 3 times, drill once. Ta-da! My wife and I hung the panel this morning, here is my youngest son checking it out. 2 ladders, and attaching the far side chain first, then the near side chain. 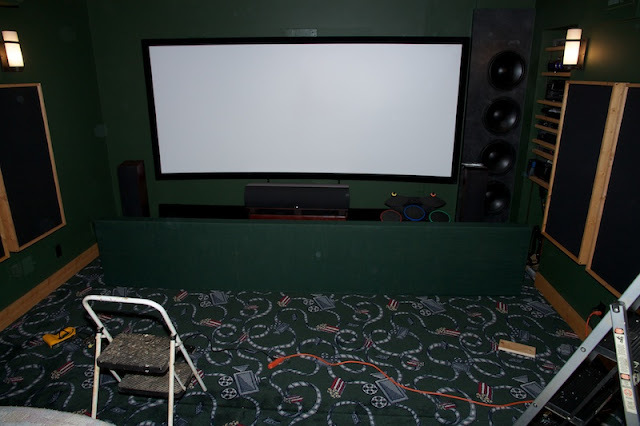 here is pict from rear of theater, only once did my drill go too far and the chuck "bit" into the ceiling drywall, I spackled and painted that since this pict. My boy wants to know everything dad is doing and why....luv the guy so much! The projector beam exits @ 13" from the ceiling, and the screen top edge (image edge) is @ 18" from the ceiling. This panel is 4" thick and almost 12" from ceiling at the bottom, I hung it low for more bass trapping, and also atheistically its same as the LH side soffit. The pj light beam is about 2 1 /2 inched below this trap here, so no interference. 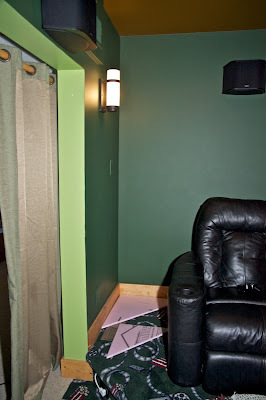 This 2nd row ceiling treatment catches some of the light from those 3 can lights, but its not so bad. However, my 1st row - possible acoustic ceiling cloud, would block all 3 lights, so I'll need to address that at later date. 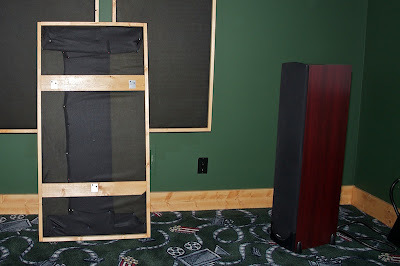 Next up: removable corner bass traps - I need to clean in back of those chairs, only way is removable bass traps. Here my "prototype", a 24" x 24" x 37" triangle and a 17" x 17" x 24" triangle from pink foam board. Confirming how high I can go with the bigger/deeper triangle before the sconce (about 5' 6" or so), then will use the smaller size up to the ceiling. Thx, it felt good to get the cloud done and hung. The carpet, we liked the HT theme in it, and at the time our walls were bare. Thx for remining me, I owe the guy who sold me the carpet a HT picture, and was waiting for my acoustic panels to go up before taking one....just my 1st row couch is getto and due for replacement April when bonus checks come in. 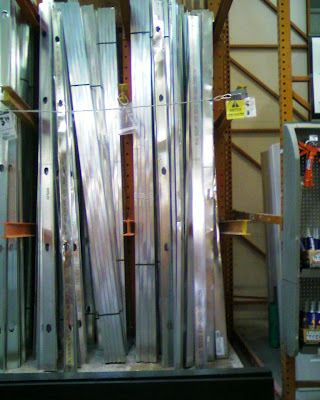 Returning stuff at Home Depot during lunch, I was studying how to do removable corner bass traps. 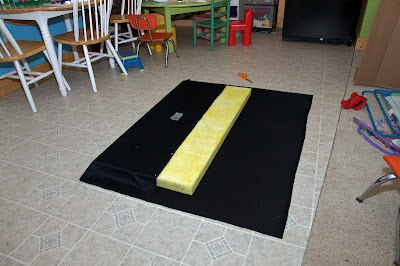 I bought some handrail and may "play" with that this weekend. 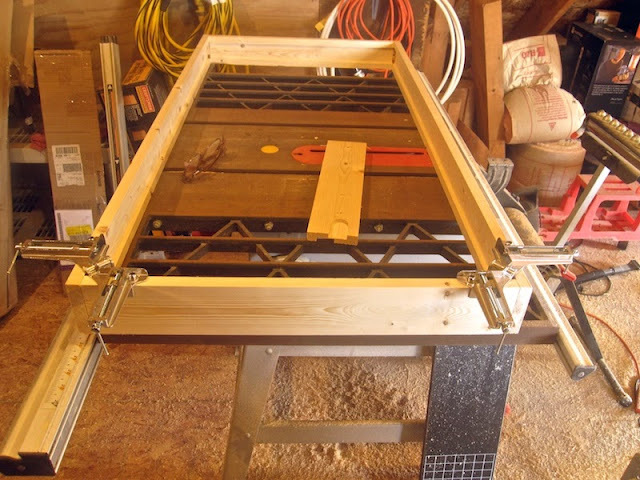 1) Use steel stud frame instead of wood. 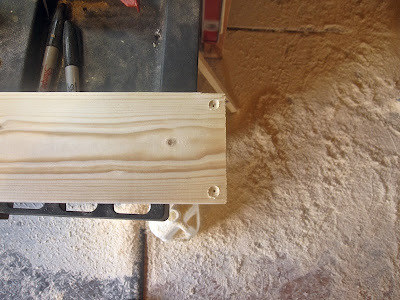 3 5/8" wide, easy to make a box, and the edges would naturally grab the fiberboard. Of course you'd want to wrap them with the fabric material, unless you wanted a industrial look and painted them instead. 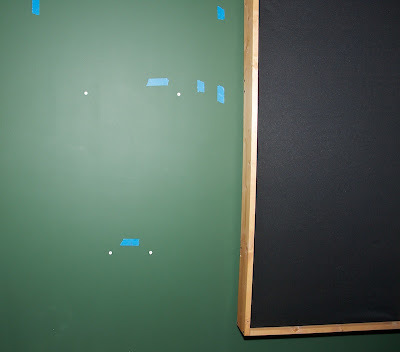 Bonus: They have some holes in the sides so you'd get some "extra" absorption, or more closely match the test specs since I've read their absorption Coefficients @ various hz are done on panels totally exposed, edges included. 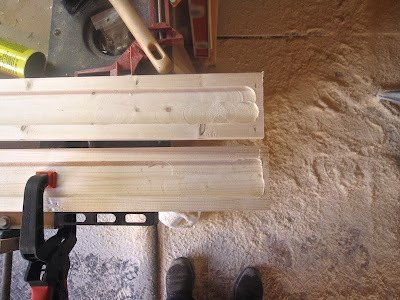 2) Use Glass block plastic channel instead of wood. 4" wide, easy to make a box, and the edges would naturally grab the fiberboard. 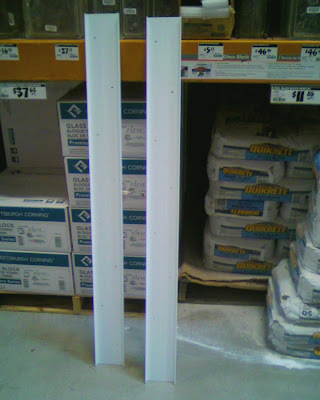 These are exactly 48" tall, perfect for 2' x 4' sheet, 3 needed per panel. Possible rivits to hold the channels to each other, with an inner angle channel if needed? 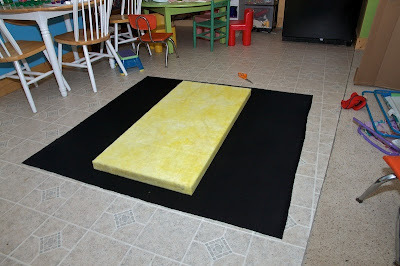 First make the box and see how sturdy it would be before adding reinf. Guess once they make their's they move onto other things and don't read these threads, since not on their mindset. don't worry. i will upload some photos the next time i get around to working on the frames again. so far, i managed to get 3 completed last weekend and since it's my first time doing it, i wanted to focus on trying to get it done right.